Lakka is an open source game console emulator. See the YouTube demo here (there are many YouTube videos too, including a Hak5 intro video here!). You can boot to Lakka from a variety of different computers including a Raspberry Pi. On an x86 PC you can directly boot from a USB drive (or install it onto a dedicated PC, if you have one to spare!). Lakka does not support\work on a Virtual Machine - you must boot from a REAL SYSTEM! You also need to connect USB or WiFi controllers to the PC too (recommended because using the PC keyboard is very difficult/impossible when playing games using the PC keyboard!). I downloaded the Windows 32-bit version for a PC from here and then wrote the .img file (Lakka-Generic.i386-devel-20161002110423-r21593-g03241bf.img) to a spare 8GB USB 3.0 drive using RMPrepUSB (see below for details). For Nintendo 64 games, use Lakka 64-bit. I then booted from the Lakka USB drive on my IdeaPad 300 (does not work on Virtual Box). When you first boot, it automatically partitions the USB drive so that the 2nd partition is made as large as possible (max-512MB for 1st partition). For this reason, if you want to eventually add Lakka to your E2B USB drive, I suggest you choose a spare USB drive for Lakka of only 1GB or 2GB max (don't worry if it is slow - we will transfer it to the E2B USB drive later). I then downloaded a copy of the N64 Super Mario 64 ROM file (Super Mario 64 (USA).zip 6MB) onto my Windows PC and transferred it to the Lakka USB drive that was connected to the IdeaPad 300 via Ethernet. Tip: Google for 'Lakka roms download' to find ROM files. Tip: Unzip the game first (e.g. to xxxx.n64) - this saves space because if you copy the .zip file, Lakka will unzip it anyway and leave the .zip file there as well. To learn how to do this in more detail, I suggest you buy Issue 408 of WebUser magazine (this weeks issue) and refer to page 61 and watch the You Tube videos. Here are the steps I used, in outline, to get Lakka onto my E2B multiboot USB drive. Note: This blog post is not about how to use Lakka, it is only about how to transfer it onto your E2B USB drive once you have it working. You can then carry your E2B USB drive with you and take it to your friend's house and play any console game on his/her PC. Use 7Zip to extract the boot files to a new folder. Use 7Zip to extract the contents of the 524MB 0.img file which is inside the Lakka-Generic.i386-devel-20161002110423-r21593-g03241bf.img file to an empty folder (e.g. C:\temp\Lakka0). The folder C:\temp\Lakka0 should now contain an 8MB KERNEL file and a 235MB SYSTEM file plus various other files, if you have done this correctly. Drag-and-Drop the C:\temp\Lakka0 folder onto the MPI_FAT32 Windows Desktop shortcut and make a C:\temp\lakka.imgPTN file. Use the size suggested. You obviously need to have installed the MPI Tool Pack onto your Windows PC first. If asked, choose 5 or 6 for the syslinux version. Switch to the new lakka.imgPTN partition by using \_ISO\SWITCH_E2B.exe and double-click on the lakka.imgPTN&lakka file. 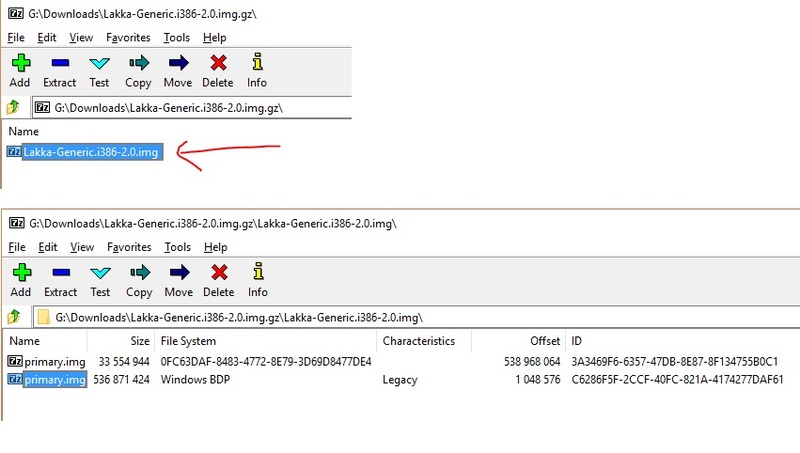 You should now see the contents of the first 'Lakka' partition on the E2B USB in Windows Explorer. It should contain the \SYSTEM and \KERNEL files in the root + many others. See the instructions below for how to copy ROM files, etc. Tip: If Lakka boots, but you don't see any icons in the menu system (just blue blocks), then you have not made the storage partition lakka file correctly. Lakka 2 2017 may not boot in a VM such as Virtual Box (just get lakka icon but no 'Desktop'- try booting on a real system). The CSM menu #1 will only boot to the normal lakka syslinux boot: prompt. You can type live [ENTER] or install [ENTER]. However, only the install option will work. You must use the new Lakka CSM menu entry to boot to Lakka live. 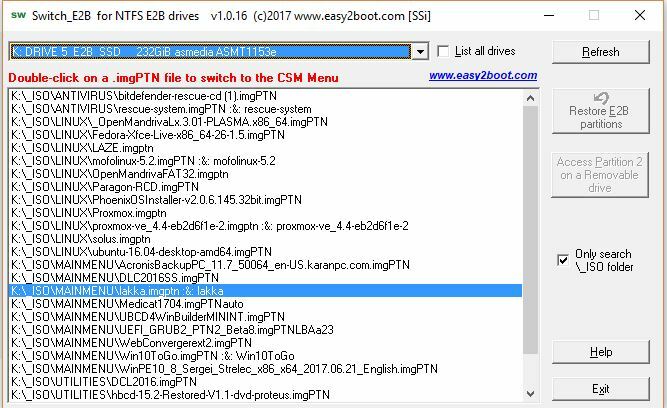 For UEFI-booting, you will need to modify the \EFI\boot\syslinux.cfg file and replace the disk= parameter with disk=LABEL=storage, e .g. You can also modify the \syslinux.cfg file in the same way if you want to boot using syslinux (menu entry #1). This saves having to modify the \menu.lst file. If you see a 'boot:' prompt when UEFI booting - press TAB to see a choice of either live or installer. Type live and [ENTER] to boot to the live version. Once you run Lakka, it seems to affect the USB controller on some systems. If you try to reboot from the USB drive again, you may find that your BIOS does not give you the option to pick the USB drive as a boot drive. In this case you must switch off your PC\notebook - wait 15 seconds - then switch it on again. If you are using a notebook and this does not fix the USB boot issue, remove the notebook battery and disconnect the AC adapter after you switch it off, so that all power is removed for 15 seconds. Use 64-bit version if you want to run Nintendo-64 games. 1b. Extract the Lakka-Generic.i386-devel-20161002110423-r21593-g03241bf.img file using 7Zip. 1c. Use RMPrepUSB - File->Drive - (img file) - 0 - 0 - 0 to write the .img file to a spare USB flash drive of size 1GB (WARNING: All contents on the flash drive will be destroyed). Don't use a too large a USB drive because we will need to image it and then copy the image to the E2B drive. Use a 1 or 2GB drive if you have one, rather than an 8GB or larger drive. 1d. Connect the USB drive to a real PC (it does not work using an emulator like QEMU or Virtual Box!) and choose the 'Run Live' option. Allow it to resize and maximise the 2nd partition when it boots and allow it to get to the Main menu. 1e. Connect an Ethernet cable from the Lakka PC to your router/network. 1g. Download any ROMs you want from www.emuparadise.me on your Windows PC and copy them to the 'ROMs' folder under 'LAKKA'. I tried Super Mario 64 (USA).zip (6MB) and a few others. Unzip them first. 1h. Now check it is all working (you will need to read up on how to control the game and how the PC keys are mapped - press the wrong key and it can reset or reboot!). Read the WebUser article to see how to load a game or watch the YTube videos. You will need to connect a game controller (USB or WiFi) to be able to play any game. Tip: Use the Z key=Back and X key=Select and cursor keys. ESC=abort. Enter may also work. Inside a game, you will need look up what PC keys to press (it is not obvious!). Beware ESC=back, H=reset, P=Pause, X=go, Enter=Select, +/- keys=volume. See the Input settings for more keys. To turn, etc. you may need a game controller! WARNING: You must use a Lakka flash drive that has been successfully booted to the Main Menu at least once, so that the 2nd partition has been expanded. 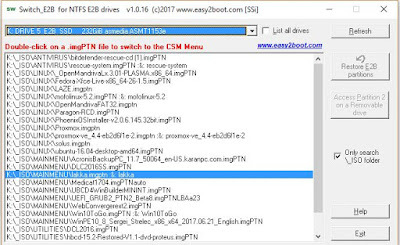 If you use a 'virgin' Lakka USB drive, the first boot may erase your E2B drive! Use RMPrepUSB - Drive->File - (filename=C:\temp\Lakka) - P2 - P2 - 0 to save partition 2 to a file. Note that the size of the file will be the size of the USB drive, minus 512MB. The file that is made should have no extension. Use 7Zip to extract the contents of the 524MB 0.img file which is inside the Lakka-Generic.i386-devel-20161002110423-r21593-g03241bf.img file to an empty folder (e.g. C:\temp\Lakka0). The folder C:\temp\Lakka0 should contain an 8MB KERNEL file and a 235MB SYSTEM file plus various other files, if you have done this correctly. Drag-and-Drop the C:\temp\Lakka0 folder onto the MPI_FAT32 Windows Desktop shortcut and make a C:\temp\Lakka.imgPTN file. Use the size suggested. You obviously need to have installed the MPI Tool Pack onto your Windows PC first. Now copy both the C:\temp\Lakka.imgPTN and C:\temp\Lakka files to your E2B USB drive (e.g. to the \_ISO\MAINMENU folder). The file names must be identical. 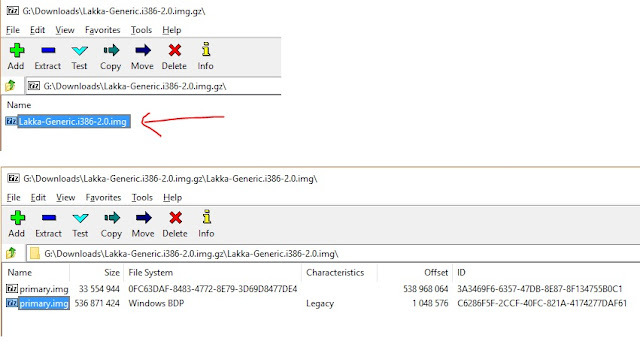 Switch to the new Lakka.imgPTN partition by using \_ISO\SWITCH_E2B.exe and double-click on the Lakka.imgPTN file. If you wish you can delete the 'BOOT from this drive' and the two 'Alternate boot' menu entries from the \menu.lst file because they won't work anyway (items 1, 2 and 3 in the screenshot below). Select the LAKKA entry to run it live. If you have display issues when getting to the Main Lakka Menu, add vga=ask to the cheat codes after the word quiet. You can copy more game files to the ROMs folder (if there is room) using Windows Explorer. P.S. I did not actually test the Install menu item for obvious reasons. If you are not going to install Lakka to a spare PC, then you can omit that menu entry.